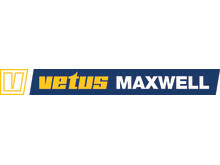 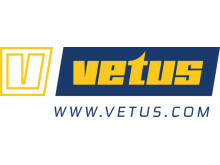 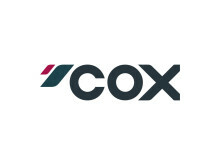 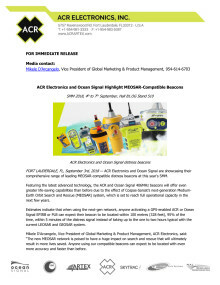 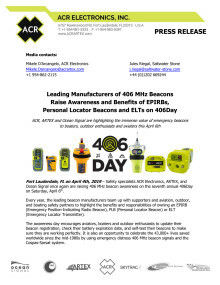 Safety specialists ACR Electronics, ARTEX, and Ocean Signal once again are raising 406 MHz beacon awareness on the seventh annual 406Day on Saturday, April 6th. 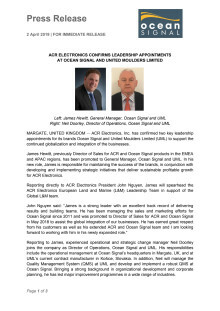 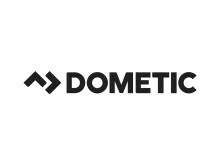 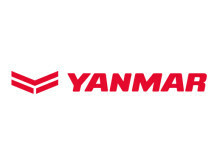 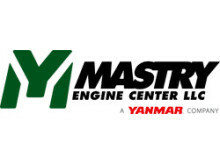 ACR Electronics, Inc. has confirmed two key leadership appointments for its brands Ocean Signal and United Moulders Limited (UML) to support the continued globalization and integration of the businesses. 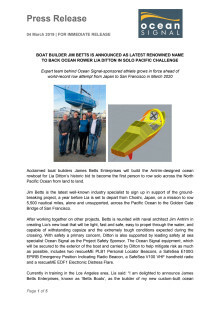 Acclaimed boat builders James Betts Enterprises will build the Antrim-designed ocean rowboat for Lia Ditton’s historic bid to become the first person to row solo across the North Pacific Ocean from land to land. 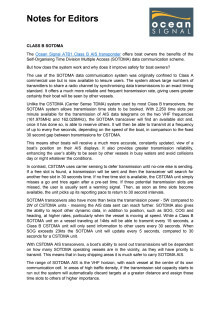 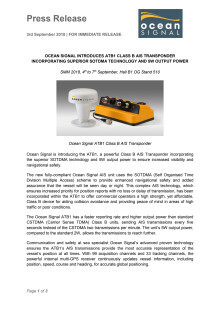 Ocean Signal’s new high-performance SOTDMA ATB1 AIS transponder will be available to customers in Europe this December and other markets in early 2019, offering boat owners around the world access to one of the most advanced Class B solutions for increased visibility and navigational safety. 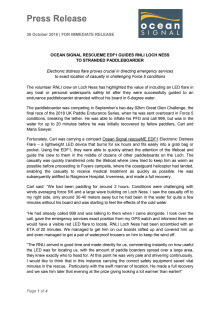 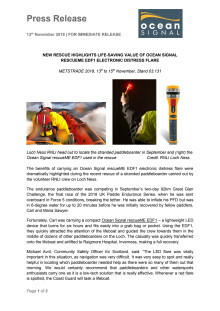 The benefits of carrying an Ocean Signal rescueME EDF1 electronic distress flare were dramatically highlighted during the recent rescue of a stranded paddleboarder carried out by the volunteer RNLI crew on Loch Ness. 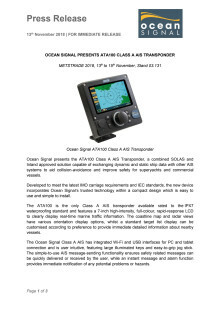 Ocean Signal presents the ATA100 Class A AIS Transponder, a combined SOLAS and Inland approved solution capable of exchanging dynamic and static ship data with other AIS systems to aid collision-avoidance and improve safety for superyachts and commercial vessels. 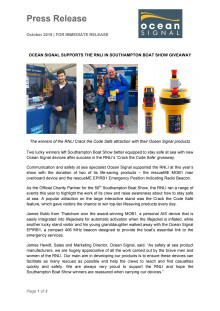 Two lucky winners left Southampton Boat Show better equipped to stay safe at sea with new Ocean Signal devices after success in the RNLI’s ‘Crack the Code Safe’ giveaway. 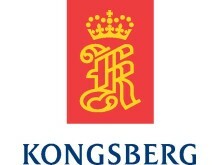 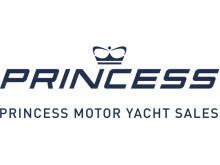 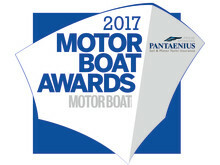 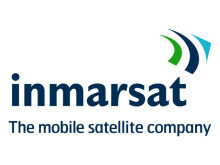 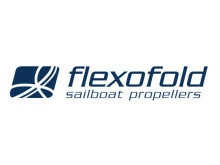 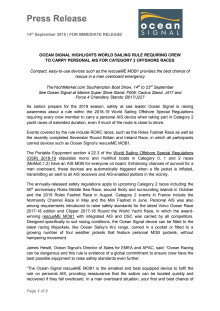 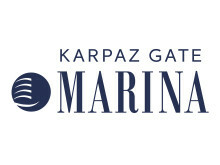 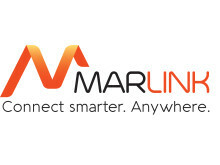 As sailors prepare for the 2019 season, safety at sea leader Ocean Signal is raising awareness about a rule within the 2018-19 World Sailing Offshore Special Regulations requiring every crew member to carry a personal AIS device when taking part in Category 2 yacht races of extended duration, even if much of the route is close to shore. 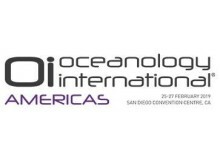 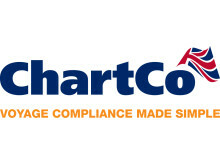 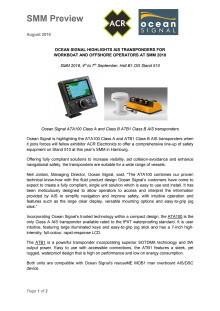 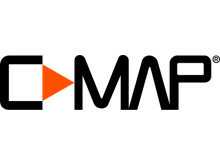 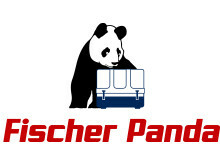 Ocean Signal is highlighting the ATA100 Class A and ATB1 Class B AIS transponders when it joins forces will fellow exhibitor ACR Electronics to offer a comprehensive line-up of safety equipment on Stand 510 at this year’s SMM in Hamburg. 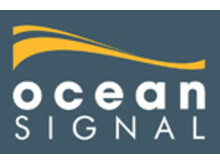 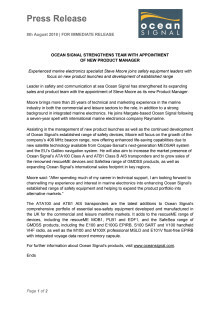 Leader in safety and communication at sea Ocean Signal has strengthened its expanding sales and product team with the appointment of Steve Moore as its new Product Manager. 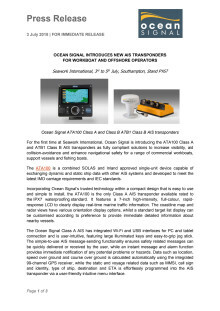 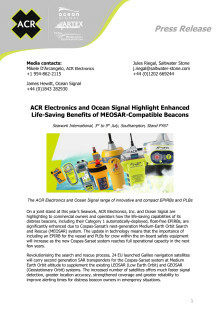 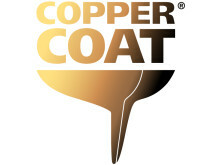 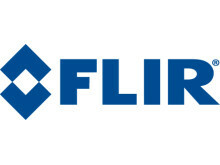 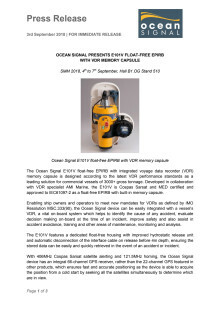 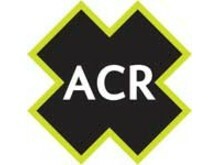 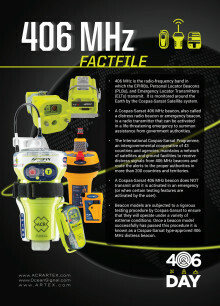 On a joint stand at this year’s Seawork, ACR Electronics, Inc. and Ocean Signal are highlighting to commercial owners and operators how the life-saving capabilities of its distress beacons, including their Category 1 automatically-deployed, float-free EPIRBs, are significantly enhanced due to Cospas-Sarsat’s next-generation Medium-Earth Orbit Search and Rescue (MEOSAR) system. 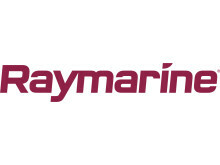 For the first time at Seawork International, Ocean Signal is introducing the ATA100 Class A and ATB1 Class B AIS transponders as fully compliant solutions to increase visibility, aid collision-avoidance and enhance navigational safety for a range of commercial workboats, support vessels and fishing boats. 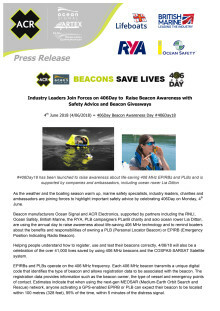 As the weather and the boating season warm up, marine safety specialists, industry leaders, charities and ambassadors are joining forces to highlight important safety advice by celebrating 406Day on Monday, 4th June.